The El Capitan Theatre continues its annual Valentine Day’s tradition of showing Disney’s animated classic “Lady and the Tramp” from Monday, Feb. 11, through Monday, Feb. 18. Directed by Hamilton Luske, Clyde Geronimi and Wilfred Jackson, the film follows the adventures of a young cocker spaniel from a respectable house, and her romantic escapades with Tramp, a mutt from the wrong side of the railroad tracks. Lady’s comfortable life with her human family undergoes some dramatic changes with the arrival of a newborn baby, and she turns to Tramp for support. Together, they have several memorable outings, including a romantic moonlit spaghetti dinner at Tony’s. 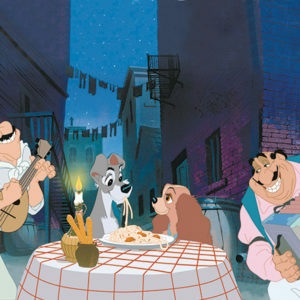 The “Lady and the Tramp Valentine Dinners” will be held at 5:30 p.m. (prior to the 7 p.m. screening) at Miceli’s Restaurant, 1646 N Las Palmas Ave. The dinners are $40 per person; advance reservations are required. Guests will check in at the El Capitan Theatre prior to dinner and shuttles will take them to and from the theater. The El Capitan Theatre is located at 6838 Hollywood Blvd. For information, call (800)DISNEY6, or visit elcapitantickets.com.